Nice… Rockettheme is one of my favorites! I would give one theme to a friend who is looking to bring her animal rescue league online, one to my mother who is setting up a site for her Avon Walk for Breast Cancer team, and I would use one to promote and sell the software I’m working on to get me through the next two years of college. I would to use this theme for my personal project. I love rokthemes templates! Awesome giveaway! RocketTheme templates are some of my favourite to work with. Niceeee!! :) My blog needs something from RocketTheme :P.
I hope to use this for starting the personal blog that I always wanted. I would start a blog finally!!! I could start a local blog :D something my place needs. Great contest! I’m constantly changing my WordPress theme so I’m sure these would come in handy. A good theme could get me off of blogger. I would use them for my lyrics script. More great lyrics websites would be cool! Of course your links would be there and a widget of your kind offer! Thanks in advance! I would use it for my friends webpage and for quickily running some of my own which I dont have the time to design right now. GOOD ! I’ll use’em for the website of my new start-up ! I would use it for my next personal blog. Pleased to see that Rockettheme not only makes quality templates for Joomla! but is now making great templates for WordPress and Drupal. I would update my marketing blog design ! I would use it for my Mama blog. First I would use it to update a charity website which supports a community in South Africa. Secondly I would use it for some friends so they will be able to express themselfs on the web. Cool, I would like to use this for a few websites needing a revamp! I would use it for a site for my friend who’s just starting his business on the web. I’d love to get one of the licenses! How many templates would the license grant access to? I hope it is much. I would use them on my free multi-blogging site so users can have more themes to use. that are very nice themes. I would use it for my personal blog. I could start my new personal blog. I’d use one license to create my own blog – but then I’d use the others for school blogs. My brother is a primary school teacher and I know he’d love a fantastic looking site based on the rockettheme templates. I’m also moving house to a place in the country and the region doesn’t have a good web presence. I’d use one of the templates to set up a regional blog and encourage local businesses to submit their latest news and information. I know that these wordpress templates from rockettheme are extremely seo friendly, so I’m sure that it would bring in traffic from search engines for those businesses. Nice. I’d use some in my WP based projects. I have to depelope some WP projects in a near future. These themes are just what I am looking for. I would use a theme to setup my new business website and possibly to create a website for my mates wedding. Give it to me :D! I would use it for personal development, to be able to offer a better service to my clients. My website could also use an upgrade.. It would be very nice! The photographic association I collaborate with would be very pleased to renew its “web skin”. I am redesigning my personal site and am planning to use WordPress. To have a selection of some premium templates from RocketTheme (a site that my employer already uses for a Joomla site) would be outstanding! I would use them for some non-profit sites of local charity and social organizations that are currently on hold. I use Afterburner on Joomla! I’d use Rocket everywhere! I have 3 projects on standby: a blog for a nonprofit organization about Creativity; finally move my blog to wordpress and a Christian church blog. that’s what I´ll do when I win a prize. I’m currently working on my employer’s new website, which is built under WordPress. This theme would be the perfect starting point. I like WordPress, i Would like use it for create stunning ipad wordpress interface. I love RocketTheme templates! The designs are great and they have active forums. I would love to try these out on wordpress! I never won nothing on giveaways =(. I need to start my personal blog!!!! Going to use it for one of my custom WP projects. I would do my own blog or use it for several client projects. good luck to all of you. I already subscribe to the Joomla and PHP themes from RocketTheme – absolutely love their work but can’t afford to subscribe to everything they do :-( I use WP quite extensively so would make very good use of this. I would use it to put an AWESOME smile in my clients faces!! Need a new design for my personal blog. Thanks for the opportunity. This is one of the best looking packs I’ve ever seen. I would use this membership as an opportunity to expand my knowledge of WordPress development. I’m pretty good at it already but there is always more to learn! Hi, great giveaway please count me in. I would love to have a subscription from RocketTheme to help with my websites. I currently use my own designed wordpress for my blog and need a more professional designed template which is more stable so that I can attract more people to visit my site in order to grow by business. I would charge a client a lot of money for for a nice looking site that took me very little time to launch. My blog could use a good makeover! I would finally spicy up my personal website! I love Rocket Themes. Keep up the great work. 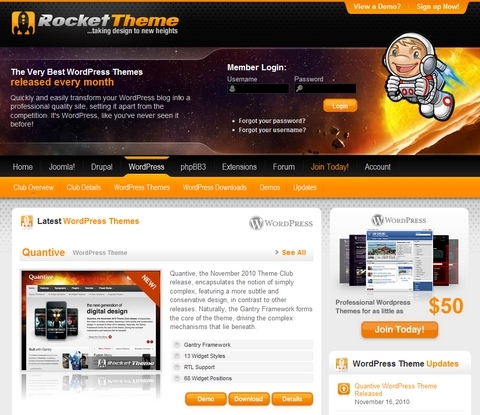 I would like to have an idea about RocketTheme and this will help me when building new wordpress themes for my clients. Thanks very much. Wow, I’d like to have it for my future websites. It’ll also let me understand better the Joomla templating. Great themes!!. I will use it for my blogs and websites. I would use them for clients. 10000 euro each site. I would use one for a website that my son wants to build so that he is encouraged to become familiar with WordPress. The others I would most likely use myself to become more familiar with WordPress theme design and development. I would love to use this to fix up my friend’s sports blog. Definitely would revamp a couple sites I’ve been needing to work on. I would update my personal page. After many years of developing static and wordpress sites for free to non-profit organizations, I have decided to take the plunge into the cold, dark waters of freelancing. This would be perfect for assisting in getting my new business off the ground! I am a member of WPMU Dev, and I’d love to join RocketTheme’s club! We are building a full game community network on the WordPress 3 platform, with a “Create your own fansite” button, and we would love to use RocketTheme’s WP themes to skin some of our 50+ websites. it would be usefull to make my own blog! My site is due for a makeover. It’s been a long time since I made the transition from joomla to wordpress. I always admired rocketthemes for their excellent theme designs and often looked at them for creative inspiration. I would love the opportunity to tap into their creative themes so my clients get to experience excellent designs. Glad to see rocketthemes join the wordpress community. Hi, I’m from Ukraine, I’ll create the business of creating websites (will be at site24.com.ua) based on templates and the license is very much helped me at first! Wow! this is amazing, definitely will make me look good at work. Great offer! I would use these on projects of course but also as a learning tool for discovering just what sort of planning and feature selection goes into a good theme. I would use these on my arcade game site to offer a better design impact. I would use this to help desing a couple of new sites I am working on. I would use the templates for the three sites I need to do. Need some nice looking templates that will stand out. Have a great day and I enjoy your Blog. RocketThemes joomla themes are excellent themes, I certainly would like to see WP themes the team creates. I would use it on my next project, ecommerce site. i would build an awesome website for my daughter. First I would use it to finish my dream sharing project. Great giveaway as always, keep up the great work. I would love to win because their designs are perfect, plus my blog needs a new outfit! good opportunity. let’s try our luck. thanks. It looks beautiful and would be suitable for my personal project too. It would be an amazing gift ever! Would like to win these themes! Because I wanna redesign my music blog ? Because I wanna redesign my portfolio ? Because I’m developing an new personal website? One word : Thx !!!! I would use these themes for my blog, because the current theme is getting very dull. I will use one to create my blog and another for a NGO which I wanted to help in getting a good design for their site to raise awareness. Please:) Can i get it? I would like to try these themes for some clients. I would love to win and be able to use this. I would start a business with Rocket Themes. They look very nice! N0ice. now pick me to win! I would offer beautiful, clean and sophisticated websites for my clients. They deserve this award! The best ones. I’ll use them to make new site for my personal bussines. Thank yuo! Tnx so much, greetings from Serbia. Nice , We will use these templates in our new designs . I would use it for my blog. I would use them to finally set up my own blog. Sure would make my life much easier! Long time joomla developer I’ve used and worked on top of Rockettheme products. Now as a WordPress developer and designer would love the opportunity to use their top-quality products again.